Eliminate clutter while you keep your furry family member happy. Tested to hold up to 20 lbs. I bought when she was a kitten, she is 5 and still loves this. It is her little hide away spot. I tried, but my cat didn't use it. He's into his 20's now and I be he would have loved it in his younger days. Arrived on time, the cats love it and used it almost immediately and still use it often. Easy to attach and stays put. My cats fight for it! Greg Hora’s invention takes the idea of a catnap to new places—under chairs, stools, and side tables. 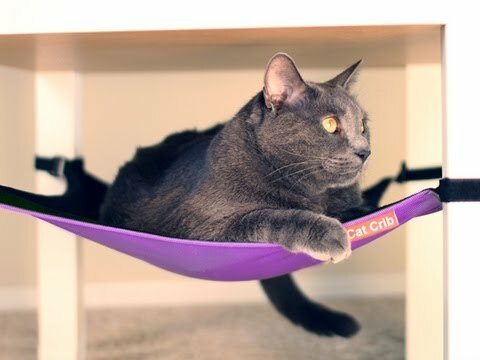 His Cat Crib is a hammock that attaches to furniture legs, creating a cozy hideaway for feline friends. As a cat hangout, the Cat Crib can be hidden and enclosed, just the way cats like it. It creates a comfy place to cuddle and the perfect vantage point for cats who like to keep watch. The machine-washable hammock is fleece on one side and nylon on the other side, and it has four Velcro straps for fastening. 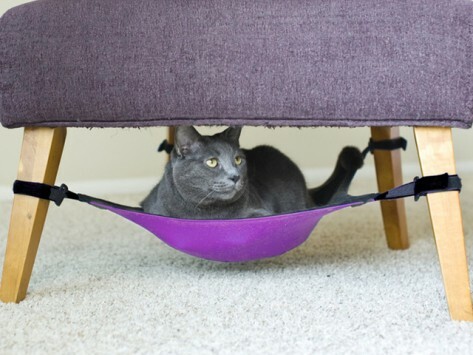 Compared to other cat furniture, it hangs out of sight and won’t clutter your living space. The inspiration for Greg’s creation is Vladimir, a cat who tore the lining underneath a bed and an upholstered chair to create private perching places for himself. With the Cat Crib, pets like Vladimir can sit pretty without ruining the upholstery.